The AASAP/UK Board would like to invite applications for the 2019/20 Lord Acton Memorial Scholarship. Application information can be found below. In 2012 AASAP/UK launched the Lord Acton Memorial Scholarship for study abroad students coming to the UK. Lord Acton was AASAP/UK’s first Honorary President, serving in this capacity from 2006 until his untimely death in 2010. His professional career included work as a banker, barrister, human rights campaigner, writer and politician. He sat in the House of Lords as both a life and hereditary peer on the Labour benches. He was a champion of international educational and cultural exchange, and offered invaluable assistance and guidance to AASAP/UK. Nina Kambili from New York University is spending a year at NYU in London. 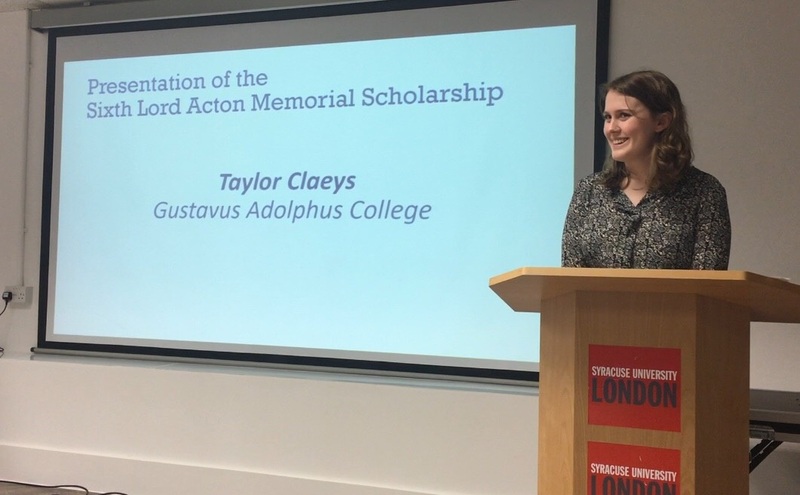 Taylor Claeys, Academic Year 2017/2018 - read her reflective essay here and see the photo of her accepting the scholarship here. King Fok, Fall 2016 - read his reflection essay here. Petra Rantanen, Fall 2015 - Read her reflective essay here. Download a flyer that can be used to promote the scholarship. Please share with colleagues in the US.